We own nothing. And we will all die someday. Just understanding these two truths about Life can lead us to complete detachment and total fulfillment. Dr.P.Srinivasan : Detached therefore Fulfilled! Last evening I had dinner with an inspiring gentleman. Dr.P.Srinivasan, 60, is a medical doctor by training. But he’s a social entrepreneur by choice. 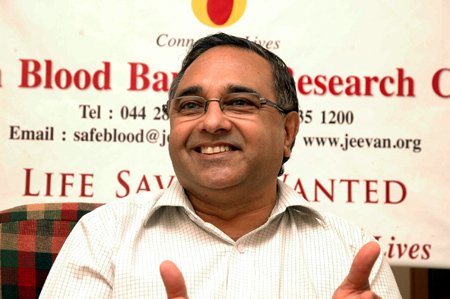 In 1995, he co-founded the Jeevan Blood Bank and Research Centre in Chennai, which has since set several milestones in transfusion medicine in India. In 2008, he co-founded another Jeevan initiative, a public cord blood banking organization and a public stem cell bank to help Indians across the world get quick and affordable access to matching stem cells for the treatment of blood cancers and Thalassemia. Life in the last 18 years have not been easy by any measure for Dr.Srinivasan or his committed team at Jeevan ( www.bethecure.inand www.jeevan.org ). Being not-for-profit initiatives the blood bank and the stem cell bank have had to struggle for raising each rupee. Further constantly battling conservative and often misguided public perceptions to their projects and programs can be depressing. Dealing with the paperwork and processes of government and public institutions while seeking grants and support can be very time-consuming and equally draining. Yet, in the last few years that I have known Dr.Srinivasan, I have always found him cheerful and full of Life. Despite his demanding schedules he finds time to pursue his interest in nature and photography. Even as his team prepares to receive a much-deserved government grant in the next few weeks, Dr.Srinivasan is penciling in an itinerary that involves him driving from Kulu to Leh in India in July this year. He is also finalizing plans to drive through Alaska in the US later, in fall, this year. How does he manage to pack so much into his Life? How does he stay fulfilled__displaying an unbeatable zest for Life? I asked him these questions even as they occurred to me last evening. I know I own nothing. His sense of detachment, I learned, is the secret for his leading a full Life. To be sure, with his credentials and his experience, Dr.Srinivasan could have continued to be in the private healthcare sector. He probably would have been far more successful in his career and wealthier too. Yet he chose to lead missions in the public, non-profit sector because of an awakened sense of social responsibility. Each step forward for him and for Jeevan has been fraught with uncertainty and humungous challenge. Yet he ploughs on __ happy, despitethe circumstances, and driven by the causes he has chosen. And he credits detachment with being the secret for fulfillment in his Life! A significant learning there from a humble, unpretentious man. Most of us believe that drive and detachment are not mutually exclusive. We think we have to be in the mission to see it through. We think that all our waking hours have to be invested only in the mission to ensure and enable its success. So, even after being successful, we often encounter a sense of incompleteness about us, in us. We burn out frequently. The truth is that if you look at Life like Dr.Srinivasan does __ without clinging on to anything, be it your mission in Life or your Life itself __ you will be far more productive and fulfilled. You will be bliss!